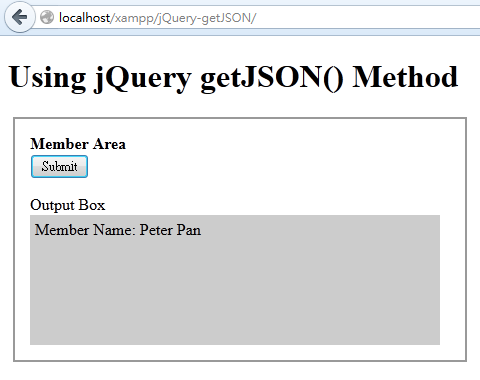 I already discussed how to Get Data from External File with jQuery Ajax Method before. Actually there is a much easier way to get data from external file (usually JSON file format). This is called getJSON() method. You may consider the getJSON() method a simplified format of Ajax Method. 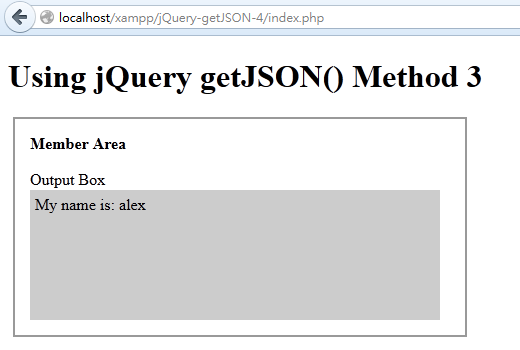 In brief, the getJSON() method is used to get JSON data using an AJAX HTTP GET request. Okay! I will illustrate how the getJSON() method works with some simple examples. Let’s start with a most simple and basic example. The webpage has a button. When the submit button is clicked, it will get the data from an external file (member.json) with JSON file format. The data of the external JSON file will display in the grey DIV layer. //  using an AJAX HTTP GET request. Here’s the content of external JSON file (member.json). What is JSON file format? JSON file format is actually similar to XML. It simply uses to store text data or text information. You may consider JSON as a text database. JSON is lighter than XML, and much easier and faster to parse. When the Submit button is clicked, the values of firstName and lastName of the JSON file will be displayed. Very simple and easy. Isn’t it? 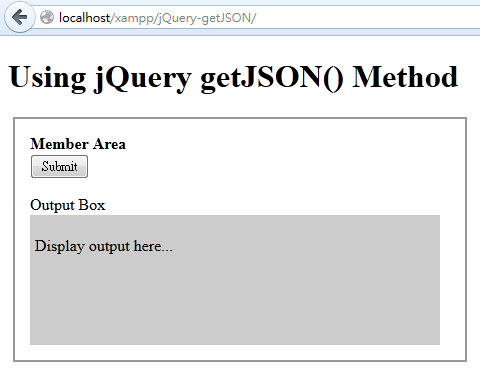 Please click here to download jQuery getJSON Example 1. In example 1, the JSON file (member.json) has only one record. When the Submit button is clicked, the values of firstName and lastName of the JSON file will be displayed. 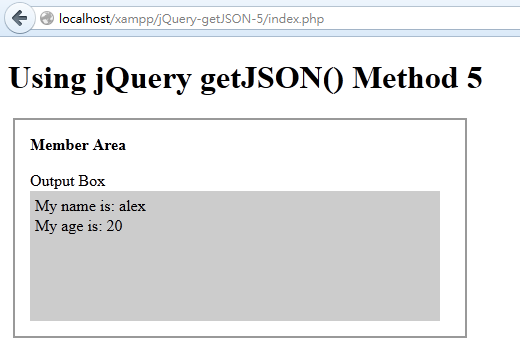 Please click here to download jQuery getJSON Example 2. There are many useful information or data (for example: financial data, weather data, etc…) hosting on the Internet. The current data file format is usually CSV. Therefore, in many situation, we need to get the data from other sources, and then convert the data into a JSON file format for using in our webpage. Let’s take PHP as an example. 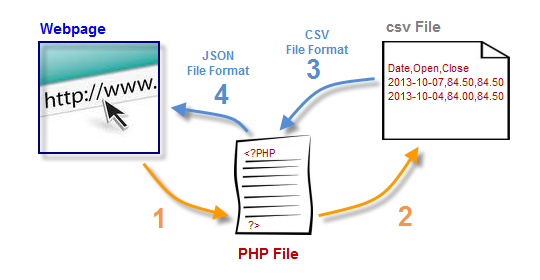 PHP can easily convert the csv file format into a JSON file format. Actually this is same for other computer languages. I am still using example 2 for this illustration, with just some minor modification. Firstly, let’s see the contents of the CSV file (table.csv). This is the stock history of a stock. In a real working application, this CSV file should be getting from the stock server, rather than a local file. Then we need the PHP file to fetch the data from the external file. And then convert the data into JSON file format. The PHP codes in this example is from GitHub, and written by me. Actually there are many similar codes on the Internet. Just modify them to use for your projects rather than starting from scratch. // Set your CSV feed if the file is hosting on other server. //  This is usually the case in a real application. When the Submit button is clicked, the values of the stock data will be displayed. I am quite sure that most file format on the Internet will be changed from csv to JSON file format in the very near future. 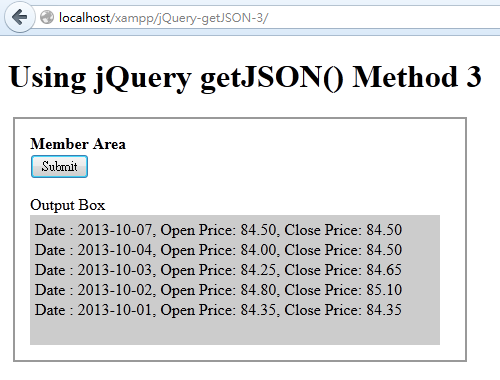 Please click here to download jQuery getJSON Example 3. A user enter information in a web form, click on the submit button. Then the user data is post to the next webpage. 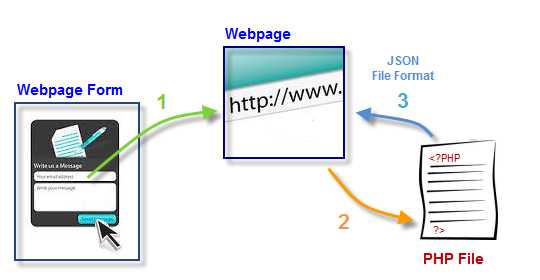 The next webpage then pass the user data using the getJSON() Method to a PHP file for processing. Finally the user data is pass back to the webpage in a JSON file format. The codes are actually very similar to example 3 with just a little modification. // This variable should be sent from a web form, e.g. Please click here to download jQuery getJSON Example 4. Here’s another example using the HTTP GET method to process the web form. Please click here to download jQuery getJSON Example 4-1. In a real application, there should be more than one variables that need to send with jQuery getJSON() method. The codes are almost the same, with just a minor modification. 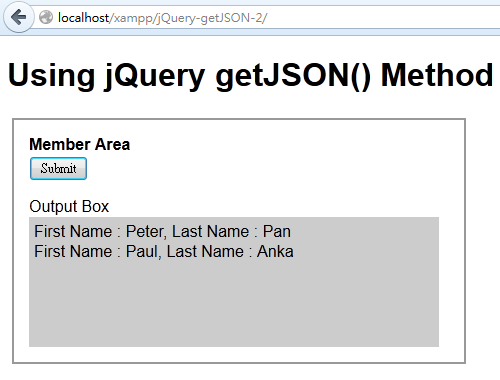 Please click here to download jQuery getJSON Example 5.